When I asked the other three members of my walking group, all of whom are in their mid to upper 70s, whether they had any concerns about future living arrangements, they each said they had none despite the fact that, like me, they live in multistory private homes without elevators and, in two cases, without bathrooms on every floor. My Los Angeles son asked recently what I might do if I could no longer live in my house, and I flippantly replied, “I’m coming to live with you.” The advantages: I’d be surrounded by a loving and supportive family, and the warm weather is a benefit for someone like me who becomes increasingly intolerant of the cold with each passing year. The disadvantages: I’d lose a familiar community and a host of friends, and his house, unlike mine, is on a steep hill with no nearby stores; if I could no longer drive, I’d have to be chauffeured everywhere. Probably my biggest deterrent would be relinquishing my independence and the incredible number of “treasures” I’ve amassed over the last half century. The junk would be easy, but parting with the works of art and mementos would be like cutting out my heart. I suspect that most people are reluctant to think about changing where and how they live as long as they are managing well at the moment. Lisa Selin Davis reports in AARP magazine that “almost 90 percent of Americans 65 or older plan to stay in their homes as they age.” Yet for many, the design of their homes and communities does not suit older adults who lack the mobility, agility and swiftness of the young. 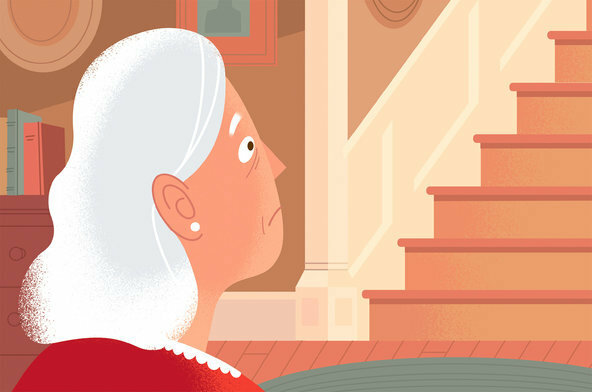 For those who wish to age in place, the authors of “70Candles: Women Thriving in Their 8th Decade,” Jane Giddan and Ellen Cole, list such often-needed home attributes as an absence of stairs, wide doorways to accommodate a walker or wheelchair, slip-resistant floors, lever-style door knobs, remotely controlled lighting, walk-in showers, railings, ramps and lifts. Add to these a 24-hour help system, mobile phone, surveillance cameras and GPS locaters that enable family members to monitor the well-being of their elders. In many communities, volunteer organizations, like Good Neighbors of Park Slope in Brooklyn and Staying in Place in Woodstock, N.Y., help older residents remain in their homes and live easier and more fulfilling lives. While many young adults chose to live and bring up children in the suburbs, a growing number of empty-nested retirees are now moving to city centers where they can access public transportation, shop on foot for food and household needs, and enjoy cultural offerings and friendly gatherings without depending unduly on others. One reason my friends and I are unwilling to even consider leaving our Brooklyn community is our ability to walk to supermarkets, banks, food co-ops, hardware stores, worship and recreational facilities, and get virtually everywhere in the city with low-cost and usually highly efficient public transportation. No driving necessary. We also wallow in the joys of near-daily walks in a big, beautiful urban park, remarking each time about some lovely vista — the moon, sunrise, visible planets, new plantings and resident wildlife. Throughout the country, communities are being retrofitted to accommodate the tsunami of elders expected to live there as baby boomers age. Changes like altering traffic signals and street crossings to give pedestrians more time to cross enhance safety for people whose mobility is compromised. New York City, for example, has created Aging Improvement Districts, so far in East Harlem, the Upper West Side and Bedford-Stuyvesant, to help older people “live as independently and engaged in the city as possible,” Ms. Giddan and Ms. Cole wrote. In East Harlem, for example, merchants have made signs easier to read and provided folding chairs for seniors who wish to rest before and after shopping. In Philadelphia, a nonprofit organization, Friends in the City, calls itself a “community without walls” designed to bring members closer to the city’s resources and to one another. It offers seniors a daily variety of programs to suit many cultural and recreational interests. Also evolving is the concept of home sharing, in which several older people who did not necessarily know one another get together to buy a home in which to live and share responsibilities for shopping, cooking, cleaning and home repair. For example, in Oregon, Let’s Share Housing, and in Vermont, Home Share Now, have online services that connect people with similar needs, Ms. Giddan and Ms. Cole report. There’s also an online matching service — Roommates4Boomers.com — for women 50 and over looking for compatible living mates. Of course, there are still many older adults, widows and widowers in particular, who for financial or personal reasons move in with a grown child’s family, sometimes in an attached apartment or separate floor. Host families may gain a built-in babysitter, and children can develop a more intimate relationship with grandma or grandpa. For those with adequate finances, there is no shortage of for-profit retirement communities that help older people remain independent by providing supportive services and a host of amenities and activities. Some have extensive recreational and exercise facilities, as well as book and craft clubs, discussion groups and volunteer opportunities. Some take residents to theatrical productions and museums and on trips to nearby attractions. I confess that retirement communities that house only older adults are not my style. I can’t imagine living in a place where I don’t see and interact with children on a daily basis. I find that nothing cheers me more than a smile or comment from a toddler. I guess I take after my father, who used to flirt with every child he noticed in a car near his. But I realize that, just as some people are averse to dogs, not everyone enjoys the companionship of a high-energy child. For older people likely to require help with the activities of daily living, there are many assisted living facilities where residents can get more or less help, including aid with medications, feeding and ambulation, according to their changing needs.